How good is your planning? 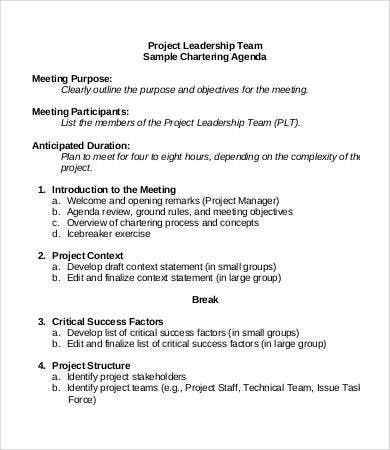 If you’ve gotten to the point in your career that you are an overall project manager, you have probably already been using a kind of Agenda Template for meetings. Agendas will help you organize your meetings and progress reports around core points, key issues, and milestone events over the course of the project’s duration. 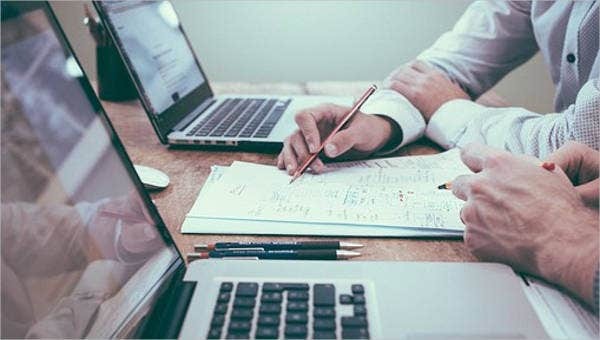 For important projects with high stakes and a lot of variables in play, you will likely be having meetings and team huddles at every turning point, every rise, and every fall of the project. These are important meetings with distinct goals and therefore solid agendas. How do you plan for each of these? You are a busy person. But take five minutes to run through these five project agenda samples to guide your direction in your next meeting. What Is a Project Agenda? The first question is: What is an agenda? Agendas are basically just lists of everything you want to cover in a meeting. It is the core guideline to steer the meeting toward its intended goal. 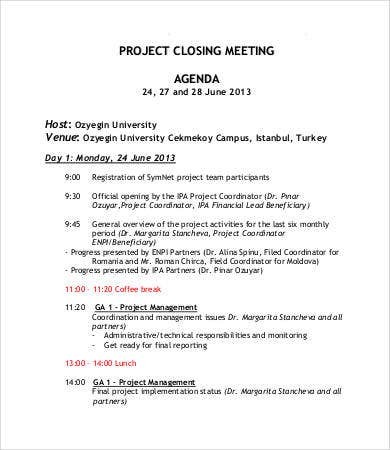 At the end of a successful meeting, it should accomplish some outcome as stated in the agenda. 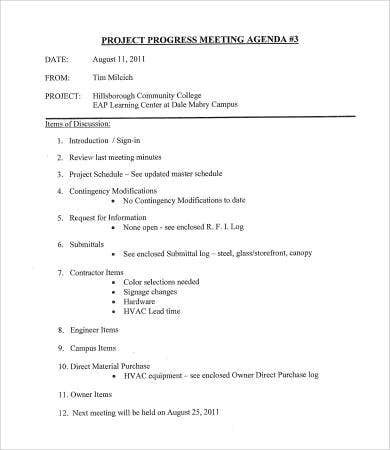 For our purposes, a project agenda is a kind of extended Event Agenda Template, the event being the project under discussion. 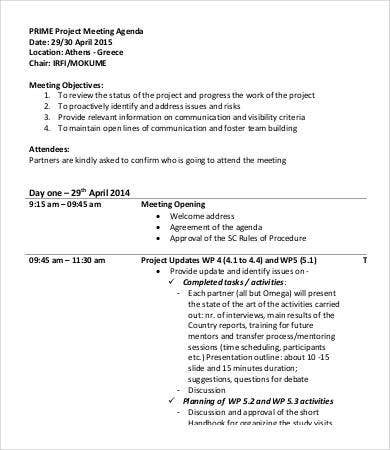 It will then list the main issues and details to be discussed during the meeting, concerning the project’s situation, progress, impact, etc. At the same time, you shouldn’t call a meeting for every small development. You don’t want to stall the very project whose progress you are fretting over. Download and study these templates. Download a Word Agenda Template and start outlining your points. 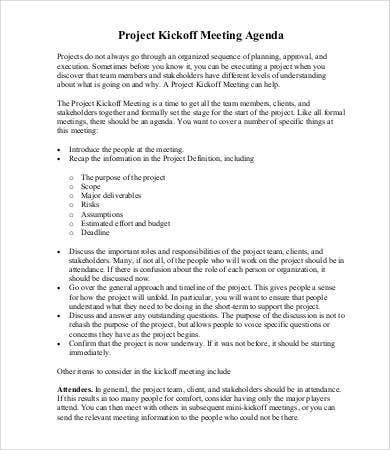 No Project Meeting Agenda Template is a take-it-or-leave-it option because naturally the details of every project, every project team, and every project manager will vary on a case-by-case basis. Use these templates, then, primarily as reference points. Each of them will be available to download as free PDF files. Any good word processor should be able to help you actually put your agenda on paper. But the insights on how to properly lay out an effective, goal-focused agenda? You can only get those from accomplished samples such as these. Use them to your advantage.